With the Trump shutdown now entering its second month, Americans are feeling the pain. 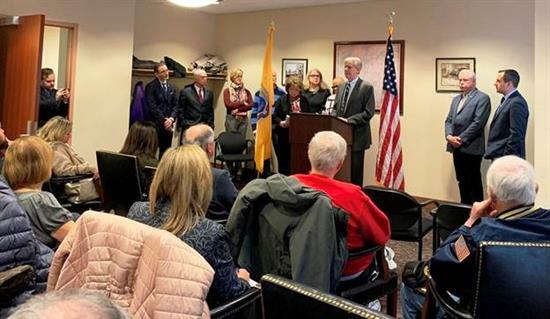 Eight hundred thousand federal employees nationally and 5,000 in New Jersey are losing their much-needed and hard-earned paychecks while millions of other Americans are also being harmed by the closure of critical services. From longer lines at airport security to uncertainty over food stamps, from home loan application delays to concerns about produce safety in the absence of FDA inspectors, the consequences of the Trump shutdown are weighing on families across the country. Last week in Metuchen, Congresswoman Bonnie Watson Coleman and I talked with furloughed federal employees about the challenges they are facing during the shutdown. These dedicated public servants work every day to keep us safe and our economy moving. It is heartbreaking to see them and their families facing so much uncertainty. As your Representative, I will continue fighting to bring this shutdown to an end and put government back to work for the people of our district. I want to know how you've been impacted by this shutdown, whether you're a federal employee or someone impacted by the limitation of a government agency. Please consider sharing your story with me on social media or by emailing Congressman.Pallone@mail.house.gov. Since the start of the new Congress, I have voted ten times on bipartisan legislation to reopen government. Meanwhile, President Trump has said again and again that he will not sign legislation to reopen government until his demands for $5.7 billion in taxpayer money to build his border wall are met. We can debate the future of our nation’s immigration system but we cannot do so in the hostage situation the president has created. The government should be reopened before we begin that debate. Lastly, one of my privileges as a Member of Congress is to assist my constituents on a range of issues, whether it be help with a federal agency, ordering a flag, or requesting tours and tickets for a visit to Washington DC. Please take a moment to visit my website to find out how I can serve you.